If you ever wondered how a rhytidectomy, or facelift, as it is commonly called, could improve your looks or self-confidence, you need to know how a facelift is performed and what you can expect from this procedure. This pamphlet can address many of your concerns and provide you the information you need to begin considering facelift surgery. Successful facial plastic surgery is a result of good rapport between patient and surgeon. Trust, based on realistic expectations and exacting medical expertise, develops in the consulting stages before surgery is performed. Your surgeon can answer specific questions about your specific needs. Is A Facelift For You? As with all facial plastic surgery, good health and realistic expectations are prerequisites. Understanding the limitations of rhytidectomy is crucial and psychological stability is vital. There is no ideal in a facelift. Rather, the goal is to improve the overall facial appearance. Skin type, ethnic background, degree of skin elasticity, individual healing, basic bone structure, as well as a realistic attitude are factors that should be discussed prior to surgery. This procedure is sometimes performed on patients in their thirties, and successful surgery has been performed on patients in their eighties. A facelift cannot stop aging, nor can it turn back the clock. What it can do is help your face look its best and give you a look of health and a more youthful appearance. A side benefit is that many patients experience increased self-confidence. Before deciding on a facelift, you should discuss with your facial plastic surgeon whether the overall effect will be more successful if additional changes are made in the chin and neck areas through other facial surgery. Many patients decide to have facial liposuction to remove excess fatty deposits in conjunction with a facelift. If several flaws need correction, more than one procedure may be necessary for the best overall result. Your choice of a qualified facial plastic surgeon is of paramount importance. During the preliminary consultation, the surgeon will examine the structure of your face, skin texture, color, and elasticity. Photographs will be taken so the surgeon can study your face. Individual risks will also be examined, especially those related to medical situations such as high blood pressure, a tendency to scar, smoking, and any deficiency in blood clotting. The surgeon will take a thorough medical history, as well as assess the patient’s mental and emotional attitudes toward the surgery. Because a realistic attitude is crucial to the success of the surgery, the surgical procedure and realistic expectations will be discussed. After the decision to proceed with a rhytidectomy is made jointly by you and your surgeon, the surgeon will describe the technique indicated, the type of anesthesia, the surgical facility, any additional surgery, the pros and cons to include possible complications, and costs of the procedure. The surgeon begins the incision in the area of the temple hair, just above and in front of the ear, and then continues around the lobe, circling the ear before returning to the point of origin in the scalp. The skin is raised outward before the surgeon repositions and tightens the underlying muscle and connective tissue. Some fat may be removed, as well as excess skin. For men, the incision is aligned to accommodate the natural beard lines. In all cases, the incision is placed where it will fall in a natural crease of the skin for camouflage. After trimming the excess skin, the surgeon closes the incisions with fine sutures and/or metal clips, which permit surgery without shaving hair from the incision site. Depending on the extent of the surgery, the process can take from two to four hours. When the procedure is performed with a combination of mild sedatives, local anesthesia, and a mild intravenous anesthesia, the patient will experience little discomfort. Some surgeons prefer to use general anesthesia for facelifts. Following the surgery, the surgeon will apply a dressing to protect the entire area where the incisions have been made. Even though most patients experience very little pain after surgery, the surgeon will still prescribe medication. Some degree of swelling and bruising is unavoidable, and your surgeon may instruct you to use cold compresses to keep swelling to a minimum. If a dressing has been applied, it will be removed within one to two days. The surgeon will also instruct you to keep your head elevated when lying down, to avoid as much activity as possible, and to report any undue discomfort. Though there are few risks in facelift surgery and thousands are performed every year, some risk exists in any surgery. In some cases, a drainage tube may have been inserted during surgery. This will be removed on the first or second day after surgery. All sutures and staples are usually removed within five to 10 days following surgery. Surgeons generally recommend that patients avoid vigorous activity. Patients should prearrange for post-surgery support from family and friends. Recovery usually takes two to three weeks, though many patients go back to work in two weeks. Scars are usually not noticeable after enough time has passed for them to mature. In any case, they are easily disguised in natural skin creases, by the hair, or, in persistent cases, by makeup until total healing has occurred. Bear in mind that the aging process continues after surgery and that some relaxation of tissues will occur over the first few weeks. Facial plastic surgery makes it possible to correct many facial flaws and signs of premature aging that can undermine self-confidence. 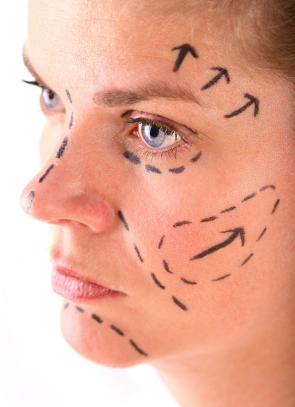 By changing how you look, cosmetic surgery can help change how you feel about yourself. Insurance does not generally cover surgery that is done purely for cosmetic reasons. Surgery to correct or improve genetic deformity or traumatic injury may be reimbursable in whole or in part. It is the patient’s responsibility to check with the insurance carrier for information on the degree of coverage.